As the lines between online and in-store retailing become increasingly blurred, your stores’ digital transformation needs to enable new in-store experiences that increase conversion rates, while empowering your associates to raise customer satisfaction with the help of new technology. Yet 74% of retailers tell us their store network is the #1 barrier to an effective customer journey from these new technologies. Retailers tell us their top five applications that deliver on the promise of great customer experience and associate enablement are: point of sale (POS), inventory management, guest Wi-Fi, workforce management, and real-time data analytics. How do you enable your network to power your store transformation and deliver a consistent, high performance in-store experience? 95% of IT Decision Makers say their network is important or critical to their company’s digital transformation. Unfortunately, today’s digital enterprise can no longer be supported by yesterday’s enterprise network! SD-WAN promises to deliver business agility and improved application performance, but recent commissioned research conducted by Forrester Consulting for Infovista shows only 22% of enterprises not using SD-WAN expect to achieve better consistency in end-user application experience. Is your network smart enough? 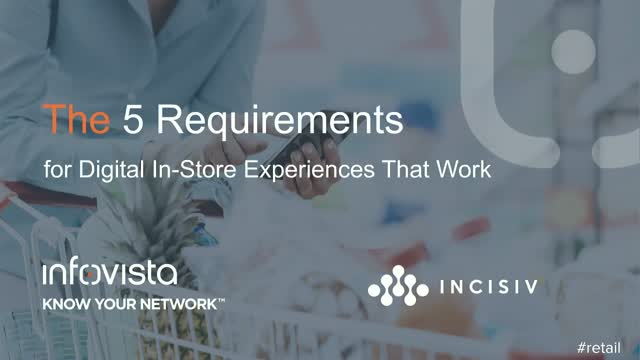 Join Gaurav Pant, Chief Insights Officer, Incisiv, and Ricardo Belmar, Senior Director, Global Enterprise Marketing, Infovista, as they discuss the 5 key imperatives that can help retailers deliver the digital in-store experiences that work. Learn why Ipanema SD-WAN, Application Intelligence for the WAN Edge, is the only solution that meets all of these requirements and how it helped the world’s largest QSR brand protect its digital revenues while enabling the digital transformation of its restaurants. Creating and delivering digital in-store experiences are a fundamental component of the digital transformation of the store for retailers. However, what controls the user experience of these applications? How can retailers consistently deliver the same high-quality experience to produce higher conversion rates to every store, for every customer and every associate, all the time? This exclusive webinar features the latest retail and consumer industry trends for digital store transformation and executive insights. SD-WANs promise to enable every enterprise's digital transformation from migrating to the cloud, to powering digital customer experiences. Why, then, do enterprises risk losing up to 3% of their annual revenue to poor application performance and application downtime? How do you ensure your enterprise network has enough application intelligence and awareness to meet these demands? Zeus Kerravala, principal and founder of ZK Research, joins us to define the five requirements an SD-WAN must meet to be application-aware. We’ll show you how to leverage application intelligence to ensure a better user experience while staying ahead of your competition and protecting your digital revenue. Learn why Ipanema SD-WAN, Application Intelligence for the WAN Edge, is the only solution that meets all of these requirements and how that helped the world’s largest QSR brand protect their digital revenues while enabling the digital transformation of their restaurants. Watch our on-demand webcast to gain a better understanding of Xhaul and C-RAN architectures, and how to assure the end-to-end performance of services across them. Learn how visibility across the RAN, C-RAN, fronthaul, backhaul, and the core networks will help pave the way for a smooth migration to 5G. SD-WAN technology will revolutionize your enterprise network, but with so many solutions available today, how can you tell fact from fiction or separate myth from reality? Will you know them all? Register now, to join Zeus Kerravala, founder, and principal of ZK Research, and Ricardo Belmar, Sr Director Enterprise Product Marketing at InfoVista, for a moderated panel discussion to uncover the truth about SD-WAN! Want to catch a preview of the Top 7 SD-WAN Myths? Then join our first-ever Tweet Chat on May 31st, at 2 pm EST to discuss some of those myths! Follow hashtag #InfoVistaChat to join us and bust those SD-WAN myths! Learn how CSPs plan to address NFV challenges and the key success factors required for a real-time and dynamic service assurance solution for NFV, and how VistaInsight can help maximize the value of the hybrid networks, and enhance service agility. Today’s mobile subscribers expect high quality, uninterrupted voice and data services anytime and everywhere they connect to the wireless network. To stay ahead of potential service quality issues that can negatively impact subscriber experience, mobile operators should continuously monitor both network performance and the real end user service experience. Now with InfoVista’s TEMS Sense, operators can remotely monitor voice and data service quality continuously across their networks – actively testing services like VoLTE, web browsing and YouTube, as well as OTT applications like Instagram, Facebook, YouTube, and Twitter. - Gain insight into how location, time, device, network and service type affect quality of service and how end-to-end active monitoring detects issues that network and service node testing can miss. - Watch a demo to see how easily hybrid WANs are deployed with Ipanema. The release of the first 5G NR standard was a critical event on the path to commercialization of this innovative technology. 5G NR creates complex RF planning challenges, due to the use of high-frequency millimeter waves, together with new advances such as flexible numerology and advanced antenna systems that can leverage Massive MIMO. Having supported a series of pre-standard trials with Tier One operators and their vendors, InfoVista’s product team has developed a comprehensive set of capabilities to accurately model 5G NR networks and automate key planning functions. Planet 7 for 5G RF planning & optimization was launched at this year’s Mobile World Congress. The propagation modeling capabilities of Planet and its unique ability to simulate Massive MIMO make it the best choice to help you efficiently plan 5G networks. Ipanema, the Application-Aware SD-WAN from InfoVista, allows you to protect end users’ experience of Microsoft Skype for Business calls. Ipanema 9.1’s new analytics and reporting tools help you better visualize Skype for Business Codecs performance and increase user satisfaction and adoption. With Ipanema, dynamically managing application performance over the WAN in real-time is intuitive, simplifying your application deployment and network operations. Ipanema, the Application-Aware SD-WAN from InfoVista, allows you to maximize end users’ experience of Microsoft Office 365. Ipanema 9.1’s new analytics and reporting tools help you better visualize Office 365 application performance and increase user satisfaction. With the latest release of Ipanema, the Application Aware SD-WAN solution from InfoVista, deploying a top-performing Hybrid WAN has never been so easy and efficient. Ipanema goes beyond streamlining and accelerating Hybrid WAN implementations. It also maximizes business-critical application performance and user experience over any network, in full alignment with business priorities. - Why SD-WAN and SDN have become the foundation for the agile, digital enterprise. - How digital transformation of the enterprise is requiring a rethink of network architectures towards a software-defined approach in the applications era. - Why moving to new application-centric network services requires the right application performance visibility and control to deliver the user experience needed to support the enterprise digital transformation. - How new hybrid WAN architectures enabled by InfoVista's Ipanema products address these challenges by delivering application-aware SD-WAN solutions. Infovista, the leader in modern network performance, provides complete visibility and unprecedented control to deliver brilliant user experiences and maximum value. Know your network with Infovista.